Snowflakes with Silver 28ct Linen  - $108.00 : Yarn Tree, Your wholesale source for cross stitch supplies. Item 5340. Snowflakes with Silver 28ct Linen. 100% Linen 35"x 39". 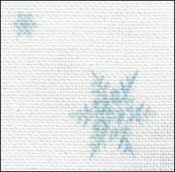 Delicate blue snowflakes of varying sizes are sprinkled throughout this piece of shimmery white linen. The blue is similar to DMC 807. Largest snowflakes are 1 5/8" diameter, with smaller flakes down to only 3/8" diameter. There are lighter color flakes as well. Silver sparkle adds a fun look. HD means Hand Dyed mottled effect. HD fabrics have been surface treated with digital textile printing using pigment inks to give a hand dyed effect. More consistent in color and pattern than hand dyed. One side is in color; the reverse side is white. Colorfast and lightfast in all but the most vibrant colors, such as orange. May be hand washed in cool water as recommended for needlework.